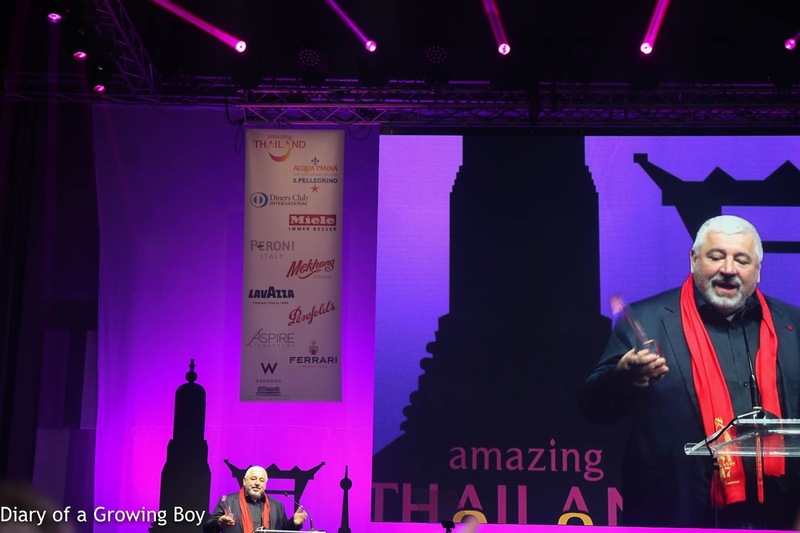 I'm back in Bangkok to attend the awards ceremonies for Asia's 50 Best Restaurants, sponsored by S.Pellegrino and Acqua Panna, which is once again held at W Bangkok and the House on Sathorn. I'm pretty excited to be back, as it gives me a chance to catch up with friends - both from within Asia as well as from other parts of the world. As usual things started with cocktails and food in the courtyard of the House on Sathorn, and I met up with friends and congratulated chefs I knew personally on being included on the list. Knowing that there was a long night ahead, I refrained from imbibing any alcohol, and just took Acqua Panna and the flavoured San Pellegrino sodas instead. It's pretty hot in Bangkok and being in a suit and tie really didn't help... so it didn't take me long to get soaked. Having learned the lesson from last year, a few of us went and lined up in front of the Great Room about half an hour before the ceremonies were due to start. There's no assigned seating, so we wanted to make sure we got to choose the best seats in the media section. The announcer rolled through the list of restaurants as usual, pausing for the presentation of specific country and special awards. 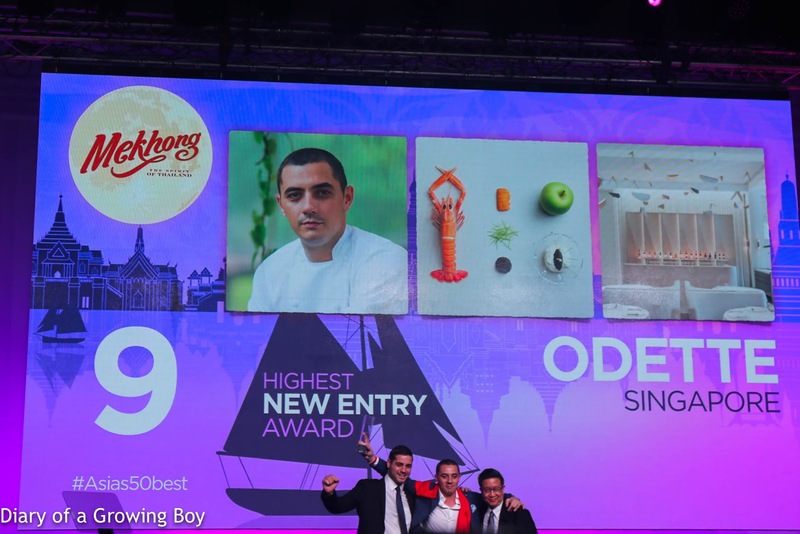 Some of the awards were announced some time ago, such as May Chow being awarded Asia's Best Female Chef and Umberto Bombana getting the Diners Club Lifetime Achievement Award. 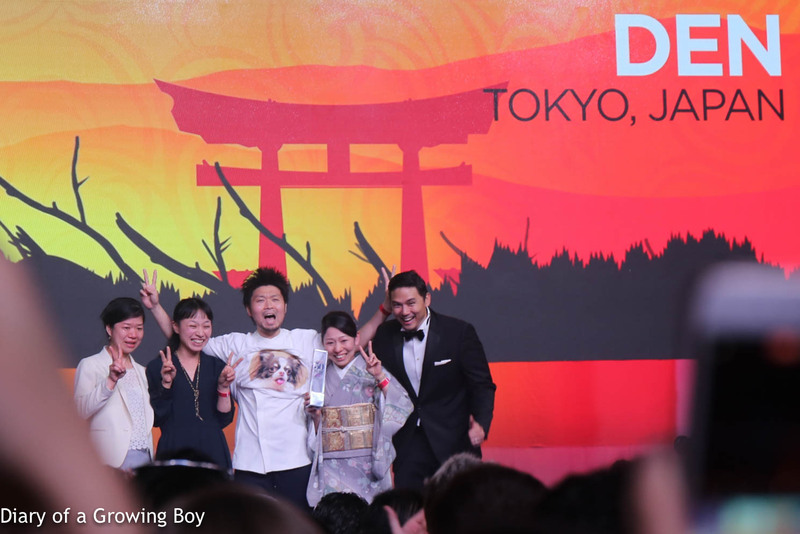 The team from Den (傳) received the inaugural The Art of Hospitality Award, and Chef Hasegawa Zaiyu let his front of house team take the spotlight, before joining them on stage. Those who know him would know of his love for his dog Puchi Jr. So there was a round of applause when he decided to "flash" the audience by flipping up his T-shirt and revealing an image of Puchi Jr. printed on the underside. Perhaps tonight's biggest surprise was the Highest New Entry Award, with Odette making its debut at No. 9. That is no mean feat! But having been to Odette last year, I can say that Julien Royer is certainly among the top chefs in the region. Things always get tense when we start counting down the top 10, and when it came down to Gaggan and André for the top 2 spots, there was no question who I was betting on. 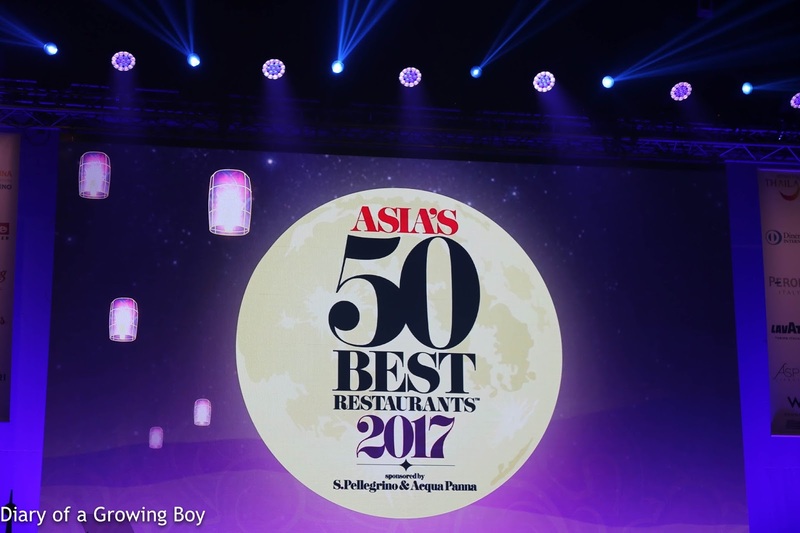 So for the third year in a row, my friend Gaggan's eponymous restaurant in Bangkok took home the title of The Best Restaurant in Asia, sponsored by S. Pellegrino and Acqua Panna. It's a THREE-PEAT!!! At the press conference, Gaggan was clearly very emotional, and talked about the camaraderie of 50 Best, telling us that he was cheering for chef friends. When André Chaing crashed and came to give him a hug, Gaggan said: "It's not about being No. 1, it's about being No. 2, too!... There's no difference between No. 1, No. 2, and No. 50." "Let's forget where we're from, we're all from Asia... Let's celebrate Thailand." 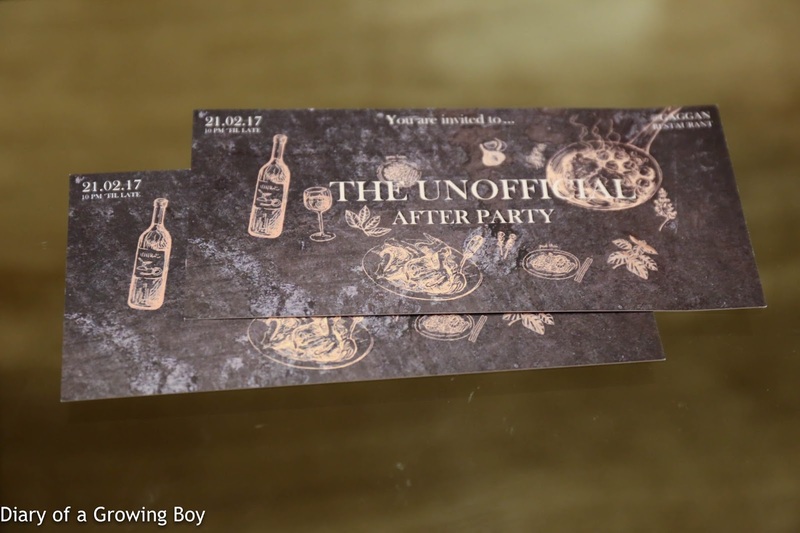 Gaggan was asked how he was going to celebrate winning this award again, and of course a bunch of us already knew - we had gotten tickets to the "Unofficial After Party". He then invited EVERYONE to his party, and promised that they "will be gentle... won't behave like Thais... there won't be any ladyboys... there won't be any street food..."
Hmmmm... we'll see about that! The Best Restaurant in Singapore, also No. 2 on the list, is André. It doesn't serve Singaporean or Peranakan food. The Best Restaurant in China, also No. 3 on the list, is Amber. It doesn't serve Chinese food. The Best Restaurant in Japan, also No. 6 on the list, is Narisawa. It doesn't serve Japanese food. Thankfully this year the highest-ranking sushi restaurant on the list is actually Sushi Saito in Japan, which came in at No. 26.